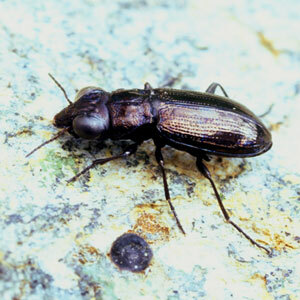 Description: Small (4-5.5mm) bronze diurnal ground beetle of dry gravelly conditions, often at altitude in mountains. Only one Irish site so far. World Distribution: A Eurosiberian Wide-temperate species (64), very locally distributed from western and central Europe to the Caucasus and West Siberia. Only recorded from the north of the Iberian Peninsula and southern in Fennoscandia. Widespread, if local, in the mountains of northern and western Britain (Luff, 1998). Irish Status: A recent discovery in the Irish fauna, taken for the first time from summit moraine on Slieve Donard, the highest peak of the Mourne Mountains, Down, by Alexander (1993). This is so far the only Irish locality. Should be present at other suitable sites in the north and west. Ecology: In Ireland, restricted to dry places on higher mountains, or coastal dune heath. Very rare and scattered.